The tenacity and effort of the staff at Hiperbaric, with the moral and material support received from numerous national and regional entities, have made it possible for the world leader in high-pressure processing technology, Hiperbaric, to remain a Castilian-Leonese firm . An achievement that has made worthy of the award for Best Business Operation of 2018, granted by the prestigious magazine Castilla y León Económica. 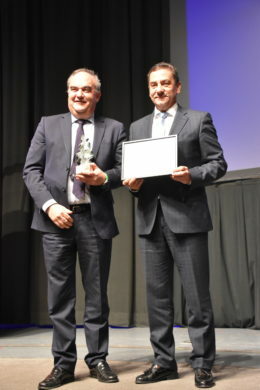 Andrés Hernando, CEO of Hiperbaric, received yesterday November 15, from the hands of Ricardo García, vice president of Europe of Benteler, the Award for the Best Castilian-Leonese Business Operation of 2018 granted by the magazine Castilla y León Económica. This award rewarded the courage, tenacity and work of Andrés Hernando and his team, composed of people from Hiperbaric and Desmasa, their strategic supplier, when betting on the purchase of the company in the month of last April. In January 2018, the majority shareholder of Hiperbaric decided to sell the company, valued at € 135 million, to its main competitor, an American multinational. Although it seemed difficult because of the level of investment required, Andrés Hernando, who had 10% of the Burgos company and a preferential purchase right, sought and found the support of several Spanish partners. Among these including Alantra, the pioneer firm in the venture capital sector, in Spain. That allowed not letting escape the technology of high pressure developed since 1999 in Burgos, abroad and perpetuate its future in Castilla y León. The company directly employs more than 120 workers, and it can be estimated that its activity generates at least 50 more jobs in companies that are its suppliers. Along with him, Ms. María Teresa Rodríguez Sainz-Rozas (Honor Award), Ávila Active Observatory 1,131 (Best Social Action), Cobreros Dairy (Best Strategy in Foreign Markets), Miguel Vergara Group (Most Innovative Product), Caja de Salud Foundation Burgos (Best Communication Strategy), Aciturri (Best Human Resources Management) and Robher Asesores (Best Young Company), were the winners of a total of 63 applications submitted. Without a doubt, the Castilla y León Económica Awards have been consolidated as the most prestigious awards in the business sector of the Community, both for the number of applications submitted (969 in its 12 editions), and for the composition of its jury and the high level of the winners. In its 12th edition, these regional awards counted with the presence of important Public and Private Authorities. Among which, Dña. Pilar del Olmo (Honorable Mrs. Minister of Economy and Finance), Ms. Milagros Marcos (Honorable Mrs. Counselor). of Agriculture and Livestock) and Mr. Carlos Fernández (HE Mr. Employment Counselor), representatives of the Regional Government of Castilla y León. Also the presidents of Cecale, Family Business of Castilla y León, of the Economic and Social Council of Castilla y León and the Association for the Progress of the Directorate of Castilla y León, among others. Although there was no speech from the winners, except for the Honor Prize, we want to show our gratitude to those who have considered Hiperbaric worthy of this distinction. In addition to other important awards, as the bronze in the Edison Awards or the CEPYME of 2015 and the Institute of Food Technologists (IFT) Innovation Award of 2008, this award is the recognition of the moral and material support that numerous national and regional entities have given us. Also shows the determination and effort of a staff that has shown at all times its professionalism and human quality. Without it, it would have been impossible to win this battle. They are the ones who have made this prize possible.